Some people collect spices as souvenirs of their travels, with exotic specimens indexed and stored in pristine condition like inventories from archeological digs. Others deck out their kitchens like pharmacological laboratories, with powders, plants, and roots displayed in glass jars. Some tuck theirs into a special box and dig through when they need them. Some people like mixes and rubs, and fix up a big batch every now and then. Many fabulous cooks I know keep a special coffee grinder reserved for spices. 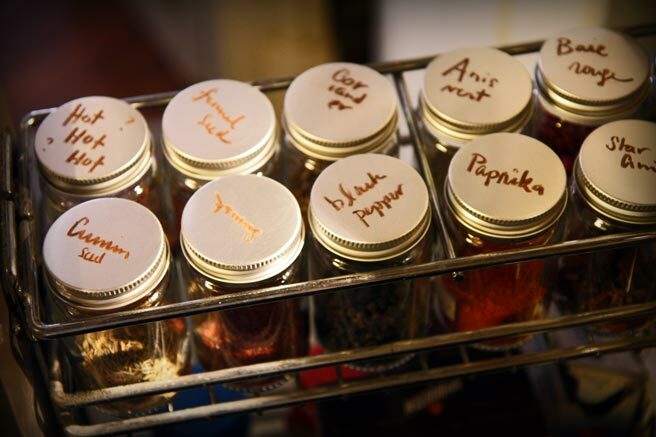 Every cook's spice collection reflects their favorite kind of cooking. Food enthusiasts can compile enormous collections that can go stale if they're not careful. How's your spice rack doing, by the way? Spices don't last forever. They should be purchased in reasonable amounts and replenished often. In taking my kitchen cure, I am replacing old with fresh. Since we're not millionaires, I have to approach this with reason and a dose of parsimony. But that does not stop me from feeling great about the possibilities for my spice rack at the moment. The first task is to take out my kitchen notebook and list the spices in my favorite recipes. Repeat appearances will make the list, and if I am planning a dish anytime in the future, I'll mark whatever I need as well. Second, browse through the cookbooks for the international cooking I love most. I think the best thing, in building my spice rack up again, will be the opportunity to make a list of new recipes to try and take on some that I realistically would like to add to my cooking repertoire. Third, rely on my friends. My friend Francine, for instance, comes from the West Indies and has a stash of freshly dried mace, collected from the nutmeg tree of her aunt, and cinnamon local to her home. I will give her a call and hit her up for some of that! There are also some spices that I have to wait to collect. For example, the anise seed. There is a producer down at the Wednesday night market that harvests wild anise and during a certain window of the year, you can get branches of it laden with the seed. I bought some last year and it was heavenly. The taste was so much better than what you could buy in a shop. So I am going to wait for that. Some spices just have to come from far away places, but many herbs can be grown. I am not very big on store bought dried herbs, and don't keep them much because I don't think the ones that have been ground to a powder, stored, shipped and traded by the metric ton taste as good as the ones you can get fresh from the market or garden and dry or freeze yourself. Which brings me to another project altogether: An herb drying rack - one made specifically for that, which can put an end to my having to fight my way through a tangle of twigs and brambles to get to a spoon to stir my soup with. keeping the kitchen cupboards neat and tidy has never been my forte - maybe i shoud follow your example! I always feel horribly guilty about spices that get stale before I'm able to use them. The main problem is that I love so many different types of international cuisines that I'm rarely ever able to get through a whole jar of something before it gets old. And I'm spoiled in having access to so many different spices at local ethnic markets and at the nearby Penzey's store. However, I do find that buying as many whole spices as possible and grinding them myself helps the freshness factor somewhat. That's a very good point. I think that this time I won't be investing as much this time in powders and mixes like curry or colombo, instead I'll get the whole spices and mix up what I need. There are a few things I'd like to learn to do from the whole spices this year, including some Indian mixes, and a good spice mix for pain d'epices and various chutneys. Dear Lucy, I, like you, live in Lyon (but only since last summer) and I have a daughter, also called Lucy, who loves eating aniseed! I was absolutely intrigued by your mention of the seller who harvests it wild. Which market does he sell his goodies at and when will the aniseed be available? I am so keen to go. Thanks also for mentioning the little shop in the 2eme, I am looking for some decent paprika at the moment and will certainly pay the place a visit! Hi Birgit, you should definitely go to the Wednesday night market at Place Carnot. There is a goat cheese vendor on the side closest to the Rhone that sells whatever herb they've got growing wild. Check back frequently over summer and find a gold mine of great things to try fresh and also hang to dry.